Do you know the macros? Yes natural peanut butter is fine. I make a half batch once a week. These are delicious. Thanks so much for this recipe. So glad you enjoyed them Lora!! These are delicious and just what I was looking for! I added one banana to mine too, it helped them stick together. So glad you enjoyed them Kaeti! Thanks! 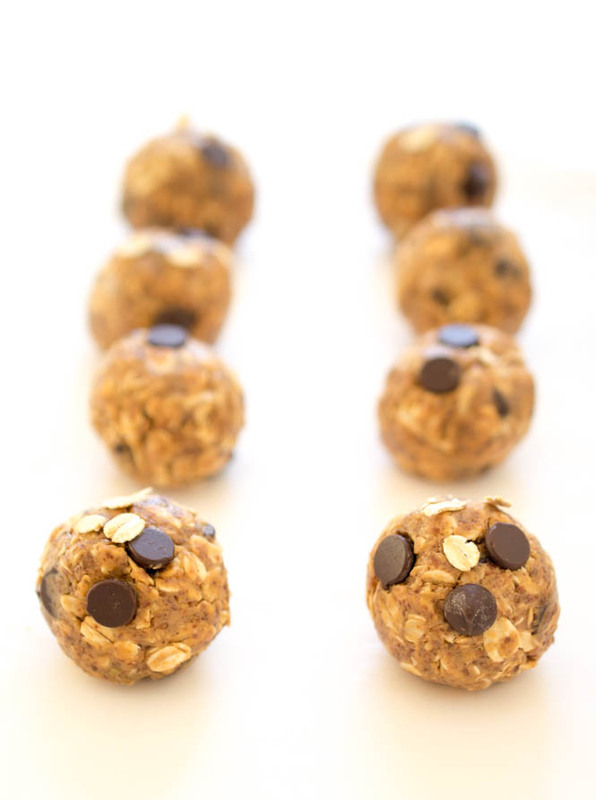 I made these with chia seeds (soaked) instead of the ground flax seed and they were delicious! The same amount of chia seeds as flax seed called for in the recipe? 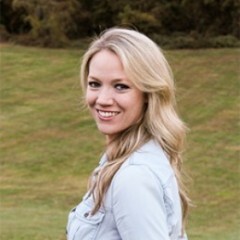 Kelley, I love these so much! They’re perfect for long overnight hikes – the protein and carbs and calories really keep me going! When I make them for hiking, I use maple and bump that up a bit and also adds some protein powder and salt for the extra electrolytes, but I love making the standard recipe for daily use too. Thanks! I plugged in the ingredients into the Calorie Count Calculator and got the following. They are about 200 calorie per serving (1 bite). The calories are a bit higher because of the peanut butter. Moderation is key with these I would stick to one as a snack per day. Do you know how many calories per bite? The calorie count breakdown is in the comments. I ran the nutrition facts a couple of times for others. My son does not like oats. 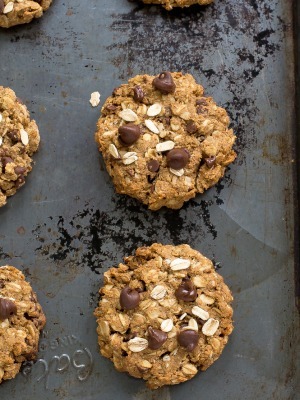 Is there something I can use as a substitute for oats? He doesn’t like coconut either. It is a texture thing. 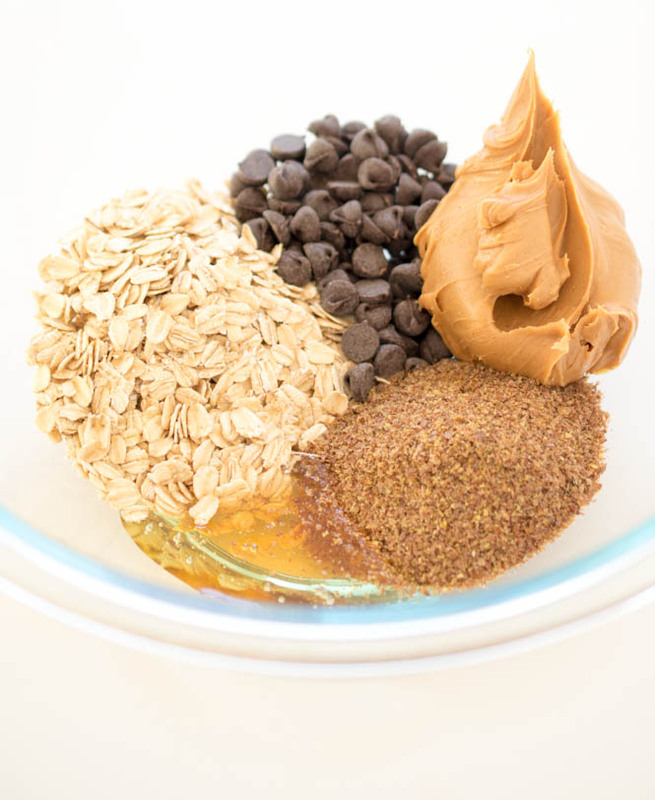 You can try substituting more flax seed or adding raw nuts to a food processor and blending those up and adding them instead of the oats. I hope this helps & you enjoy! I was looking for a muffin recipe but didn’t want to heat up my kitchen. So glad I found this no-bake, simple recipe on Pinterest. I made a double batch using this recipe but added about a teaspoon of vanilla extract. It tastes great. I filled a gallon zip with tater tot-sized balls and used some crumbly leftovers on top of my greek yogurt. 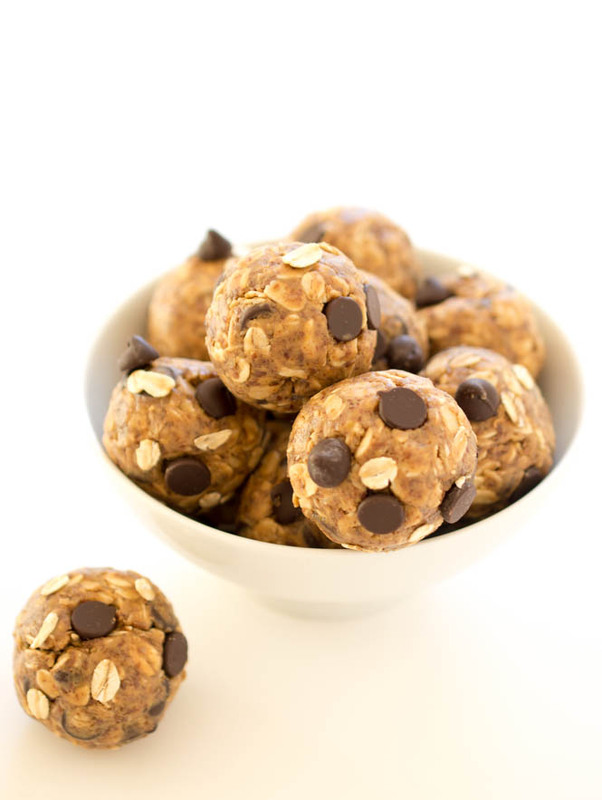 I have been looking for something palatable to eat after I drink my vegan pea protein shakes (yes, it tastes as bad as it sounds) and this will be a perfect sweet treat! I am so happy to hear you like them Paula!! I absolutely love these! 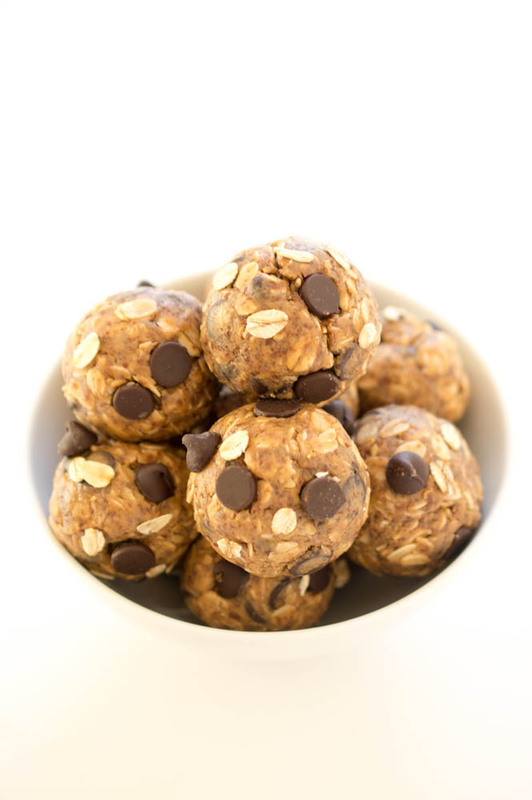 I substitute the peanut butter with almond butter since it’s better for you, and opted for gluten free all natural extra dark chocolate chips, and let me tell you, they are to die for!! So glad I found this recipe. So happy you loved them Jessica! Thank you!! So Jessica how did u do yours exactly to make it stick better? Thanks for the WW points info! I just started WW and these are delicious! What kind I peanut butter donyou suggest? Meaning all natural/freshly ground vs a brand like Jif or Peter Pan? Either should be fine. I personally always make them with Jif creamy peanut butter but that is what I usually have on hand. 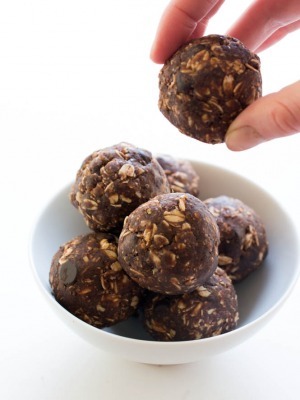 My boys all wrestle and love these quick and healthy energy balls. I use less honey and chocolate and add chopped craisins as a substitute. Best snack every! I am so glad you guys love them Sarah! Thank you! I usually use pre ground flax seed. If it is not working in the food processor I would try blending it in a coffee or spice grinder if you have one. If you follow weight watchers these are 7 sp for ONE! Looks yummy, but I’d rather use those 7 points for a meal. Hey, I was wondering…are there any other seeds we could use instead of flax seeds? Wheat germ, hemp seeds or chia seeds would be good. I tried making these about 2 months ago, and have been making them every week ever since! They are delicious, and so easy to make! Definitely my go-to snack. The nutritional info is in the comments section. Other readers have asked for it as well. Oh these are SO good and super quick to make! I’m sharing your recipe on my blog today. Thanks for the delicious recipe! I made these. Quick and tasty- but very sweet! Found these on Pintrest and made them right away! Easy and so very yummy. I added 1/2 of a banana but it made it a little too moist. I think the next time, I’ll add more flax seeds or cocoa powder. Kids said it needed more chocolate flavor. My batch is in the fridge now. Excited to see how my toddler likes these. I’ve been trying to find ways to get more fiber in her and this just might do it!